Concept diagram for the marine controlled source EM (CSEM) and marine magnetotelluric (MT) method. There are two basic marine EM techniques currently in use for hydrocarbon exploration: the broadband marine magnetotelluric method (MT) and the controlled source EM (CSEM) method. 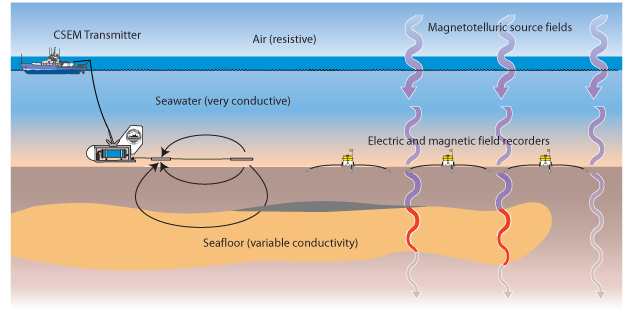 In the MT method, seafloor recordings of Earth’s naturally occurring electric and magnetic fields are used to estimate the electrical conductivity of the seafloor geology to depths of about 10 kilometers. In the CSEM method, a deep-towed electric field dipole is used to broadcast a controlled EM energy signal through the subsurface and back to an array of seafloor receivers, with sensitivity to structures at shallower depths than the MT method. While the MT method is preferentially sensitive to conductive structures, the CSEM method is preferentially sensitive to resistive structures, and in particular can detect the thin resistive layers of a gas reservoir (Wright et al., 2002; Rosten et al., 2003). Unlike the MT method, in which the ionospheric source of energy is mainly one dimensional (1D), the CSEM method uses a transmitter which generates a 3D source of energy, and so calculating the CSEM response over a 2D geological structure is usually termed a 2.5D problem (3D source plus 2D model).